HomeRace ReportsHappy 18th Birthday Imana Wild Ride! It’s nearing the end of July and there’s a Spring low tide on the eastern shores of South Africa… It must be time for the Imana Wild Ride! South Africa’s oldest and original mountain bike stage race celebrates it’s eighteenth birthday this year and promises to be everything as unique and adventurous as the first event was. Whilst the Imana Wild Ride may not feature prominently amongst the big names of South Africa’s top mountain bike stage races, it holds a special place in the hearts of those who have experienced it. There is nothing quite like it. 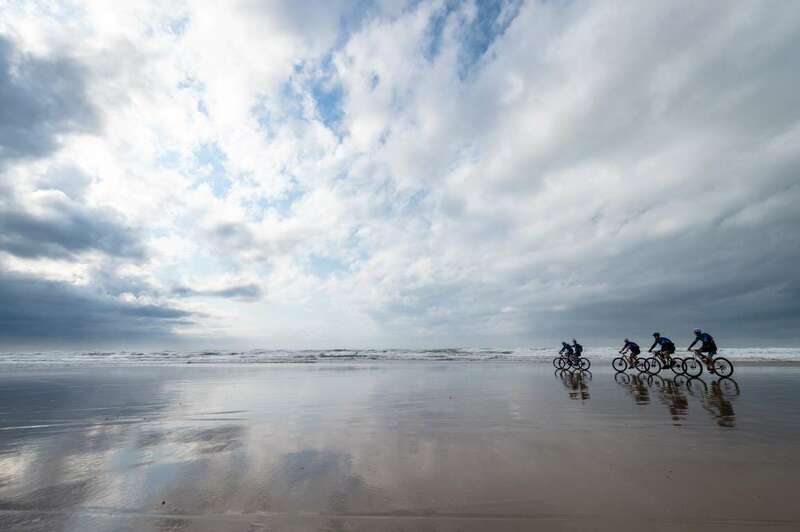 Where else in the world is one able to cycle along pristine beaches and traverse wild and remote sections of rural coastline… Added to which is the true hospitality of the Wild Coast peoples. The overnight hotels, namely Kob Inn (stage one), The Haven (stage two) and Ocean View in Coffee Bay (stage three), have supported the race over the years and pull out all the stops to make the participants feel welcome and well nourished. Morgan Bay Hotel, just south of the official starting point of the race in Kei Mouth, hosts the race registration and pre-event dinner and is a well-known holiday destination and wedding venue. To be able to finish the journey at an award-winning resort such as Umngazi River Bungalows is the ultimate treat and a little antidote to the fact the adventure is now over and it’s soon back to reality! From a small field of only two hundred participants, which started out as thirty-five (two man) teams in 2000, the Imana Wild Ride is creating a legacy of its own. The focus of this race is all about the community and giving back to this impoverished corner of South Africa which holds a bounty of wealth, not only it’s natural beauty but in its people. For this reason, the Imana Wild Ride in conjunction with their long standing and loyal sponsor, Imana Foods, have focused their energies into making a difference in these communities. This has been achieved in the form of providing classrooms and educational facilities along the race route. In 2006, the Wild Ride Education Company (WREC) was created as a non-profit organisation, in which to channel funds generated through the race, into funding classroom building. With over thirty classrooms built in the last decade, the Imana Wild Ride is excited to be building a high school facility for the first time this year. After the success of working with the Bulungula Incubator program last year and donating a pre-school at Folokwe Village, the need for a high school in this area was identified. With grateful thanks to the support of many participants over the years, sponsors and corporate donors, the Imana Wild Ride is proud to present the Bulungula College, which is due to open in September. The event comprises two batches, starting over two days. Event one, namely ‘Race the Tide’ starts on Sunday 23rd July and finishes on Wednesday 26th July whilst Event two, namely ‘Ride the Wave’ runs from Monday 24th to Thursday 27th July. The only distinction between the two events is that the first event is timed – and hence produces the winners and the second event in non-timed, making it more of a tour. In the absence of arch rival Nick Floros who holds five titles, Warren Price will be looking for his sixth successive title, having won the race since 2012. He will partner with experienced marathon rider, Andrew Hill. The unlikely combination of Stellenbosch student Damon Stamp with former pro cyclist, Darren Lill, will make for some interesting racing at the front end of the field. The mixed race holds the formidable pair of Bianca Haw and Andrew Houston, who may not have raced the event yet but with Haw a protégé of co-race founder Glen Haw, she knows the route like her back-yard and possesses the racing instincts to boot. The wryly Craig Woods and his wife Christine will no doubt have to pull a surprise sneak should they wish to give the young racing pair a run for their money !